In September 2016 the DfE outlined how they would measure pupil progress for the pupils who did KS2 tests in 2016. We already knew how attainment would be measured – a scaled score – but the performance measure was new. It is described in the DfE document Primary School Accountability 2016 which you should read before you go any further. 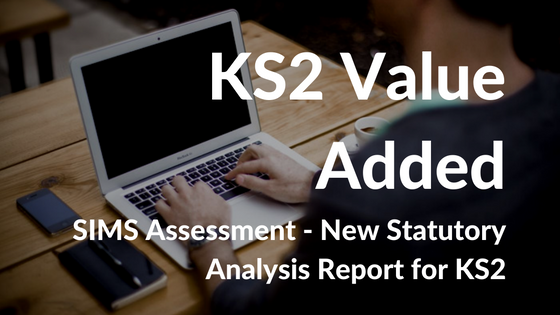 To summarise: The ‘value added’ score is calculated by using the APS score at KS1 to put each pupil into one of 21 prior attainment groups (PAGs). Each PAG forecasts what KS2 scaled score the pupil would have achieved, if they had make the same progress as a notional ‘national average pupil’ – so a pupil with an APS score of 16.26 would be placed in PAG group 14. Nationally pupils in group 14 went on to make a scaled score of 102.6 in reading . If our pupil attained a scaled score of 103, this would give him or her a value added score of +0.4. The value added score for the whole school will be the average of all pupil value added scores. Capita have released a new set of marksheets and SIMS reports that allow primary schools to calculate the value added for individual pupils on a marksheet where you can analyse your data using the powerful analysis features witin marksheets. Capita have also provided a special SIMS Report that analyses the performance of various vulnerable groups and compares your school averages to the national averages. To use them you’ll need to import a couple of templates and a SIMS report, then you’ll need to make sure you have entered the scaled scores attained by last year’s Y6. Note that the resources we describe below have 2017 in the title. This refers to the averages used within the calculations – i.e. these resources all use the 2017 estimates and calculate the PAGs using the rules introduced in 2107 and still used in 2018. In August or September the DfE will release the estimated scores based on the tests taken in 2018 and Capita will release updated version of these templates. Either go to Capita’s MyAccount website for the latest version of the KS2 resources. Use the search option to look for ‘KS2 report’ and filter the results down so that you just see the notifications from Capita. Or click this link to go direct to the page on MyAccount. Save the ZIP file to a subdirectory you can find easily, then unzip the contents. Log in to SIMS and go to Routines | Data In | Assessment | Import. Navigate to the unzipped folder and find the file called ‘KS1 APS and KS2 Statutory analysis templates’. Import both the templates listed in the file. Once the templates have imported, create the marksheets from them by going to Focus | Assessment | Templates. Locate the template called CAS KS1 APS Calculator 2017. In sections 3 ‘marksheets’ click the new button and create a marksheet for the current year 6. Locate the template called CAS KS2 Attain and Progress Tests 2017 and also create a marksheet for the current year 6. Go to Focus | Assessment | Marksheets and find CAS KS1 APS Calculator 2017: Year 6 (press the search button if you can’t find it). You’ll see this year’s Y6 cohort. We need to see last year’s cohort, so amend the group membership date to a date during or just after the SATS in May 2018. Click the refresh button next to the group membership date and last year’s Y6 pupils will be displayed. Add any missing KS1 results (tip: use the keys to success website to get access to missing results). Tip: Spend some time here making sure you have the correct KS1 results. If you have ever retrospectively entered KS1 results for pupils who didn’t have an official KS1 result (for example to provide a progress baseline) remove the results now before you proceed. Change the group membership date to the same date as you used (above) to display lasy year’s Y6 cohort. If you used Capita’s KS2 wizards over the summer to enter scaled scores you will see the scores here. Fill out any blanks and press calculate. Alternatively you may now have to enter the scaled scores for the first time. Press calculate. The estimated scores are based on the prior attainment group and reflect the average scores from this year’s KS2 tests. Each estimated score is alongside the pupil’s actual score. The difference between them (the value added) is calculated in the KS1-KS2 Progress columns for each subject. Writing was not tested, so the teacher assessment grade is used instead. For each subject a red or green column indicates if they achieved the required standard (i.e. scaled score 100+ or writing grade EXS or higher). A blue Y indicates that the pupil achieved the higher standard (i.e. scaled score 110+ or writing grade GDS). The final two columns indicate if the pupil achieved the expected or highers standard in RWM combined. The report we have just imported will only report pupils who are currently on roll. As the Y6 cohort we want to analyse has been archived from SIMS, we need to change it and allow all pupils, on roll or not, to be reported. Under ‘Report Summary’ change the Data Area: Student option (which will initially be set to On Roll) and change it to All Students. Run the report. You’ll need to adjust the effective date, which will default to today’s date. Untick the ‘bypass effective date’ and enter the date during the summer term we used earlier. Tip: If you get an error message that says there are no results to show go to Reports | Design and open up your copy of the report. In the ‘Filter Students’ section delete the Y6 filter and add it back in again – some schools refer to Year 6 as Y6 or Year6 and this seems to cause the report problems.